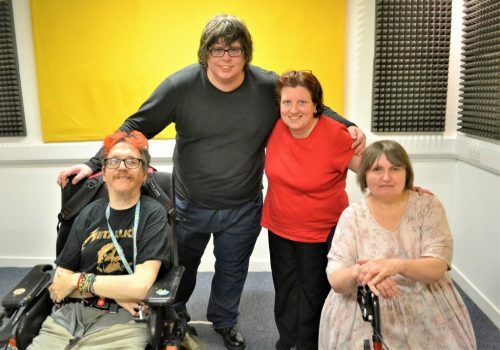 Produced by Disability History Scotland, Bella Freak’s Unwritten traces the personal histories of three disabled writer-performers. It played at Surgeons Hall during Edinburgh Festival Fringe. Sandra Alland reviews. As the first production by disability-led company, Bella Freak, Unwritten lays a promising foundation for devised work to come. Uncovering neglected and fascinating histories, Sasha Callaghan, Stuart Pyper and David Nicol present distinct accounts of growing up disabled and white Scottish. Although the writing has yet to be theatrically shaped into monologues, each story has its highlights and delicious bits of humour. Interspersed with monotone readings of old song lyrics, Sasha recounts attending a special school in London, talking to ghosts, and her Scottish father and grandmother’s work in migrant-led Covent Garden at the turn of the 20th century. Stuart describes the pain of his late diagnosis of Aspergers, school bullying, his hopes to make schools more inclusive, and his dream of having superpowers. Examining the line between loneliness and independence, David narrates a move in his youth from a special school to an integrated, but inaccessible, mainstream school in Lanark. One of the company’s core aims is ‘working towards creating a gold standard for Scotland’s arts and literature festivals to be more fully inclusive’. Compared to most events, Bella Freak offers a fair amount of disabled and D/deaf access and inclusion. But anyone purporting to lead the way in Scottish disability arts – where many excellent companies are already world-renowned for this kind of work – needs to go further than Unwritten. A barely-raised stage is placed in front of the left side of the single-level audience, leaving many people on the right straining to see. Although the company cancelled all advertised audio-described shows, they do provide BSL interpreting by Rachel Amey. Sadly, she isn’t integrated into the show, but kept in the same position throughout, forcing BSL-users to look back and forth from her to three performers who are placed increasingly far from her. 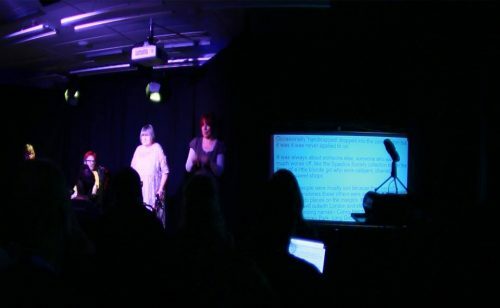 For D/deaf and disabled people who need to read captions, the script is helpfully projected onto a screen to the right of the stage. But the space is so poorly laid out that only people sitting in the front on the right can see the screen at all, and then it’s too close to read comfortably. The small black font crammed onto a white background is also difficult to decipher, and gets cut off at the bottom of each page. The writers present their memorised texts to the audience, and for all intents and purposes it seems we’re meant to be watching a play. But Sara-Jane McGeachy’s minimal direction is more of an absence than a choice, and contributes to the feeling that this piece is not yet theatre. McGeachy refrains from spotlighting each performer when it’s their turn to speak, instead leaving everyone always visible. One by one, they speak from a static position of sitting or standing. 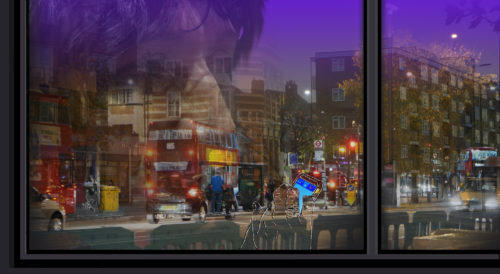 With the exception of a few moments when the lights turn purple and several lines are repeated and overlapped, there is nothing theatrical in the staging. Without lighting design, a cast of trained and directed actors, or some sort of movement onstage, the performances at times come across as clunky and lacking passion – and not fully embracing the uncompromised, unfiltered anger promised in the promo materials. Despite its lack of theatricality, there are moments of excellence in this piece. With some editing, and especially if the company more clearly defines what genre they’re working in and what role each member has, it can have a bright future. If they want the piece to be theatre, the writers can continue to shape the script and consider if performers other than themselves might bring something to its staging. But it’s likely Unwritten would better succeed as a creative live reading, rather than as theatre. Perhaps by placing books in the writers’ hands or on music stands, and with minimal but more defined captioning and lighting, the focus would shift to the words instead of the performances – and that’s where the company’s talents come together best.